Is Tokyo's energy crisis just a political power play? Leo Lewis finds out. A painless pill-sized camera can see and save what's inside you. Is there life after lithium? Nanotech fuel cells are tiny and tenacious. J@pan Inc treks to Seoul for Korea's biggest IT exhibition and finds lots to celebrate. Can an Australian outdoorsman turn Hokkaido into Colorado? Japan rocks carbon nanotubes; meet Sumio Iijima, nanotech genius. Military correspondent and television commentator Michael E. Stanley argues that the war in Iraq only exacerbates Japan's global irrelevance. Kansai columnist Dominic Al-Badri drives around with Kansai's kindest cabbies. Selling to Seniors: The "Grey Panthers" duke it out with the rip-off artists in Japan's new growth market. The US dominates the Net -- but not for long. Author John Alderman investigates IPv6, the most visionary development in Internet Protocol since the 70s, which promises to provide Japan and the rest of Asia with an explosion of Internet addresses, paving the way to a whole new world of electronic gizmos. 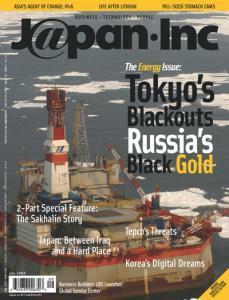 On Russia's Sakhalin island, the biggest energy boom on the planet is happening a mere 40 kilometers from the tip of Hokkaido. In the first of our two-part feature, veteran journalist Lucille Craft traces the history of this otherwise desolate former penal colony amid the challenges of radical transformation -- and the potential destruction of its environment. How to protect the environment while plundering the land. Fulbright Fellow David Wolman surveys the rigs from a Russian helicopter, soars over the icy terrain of Russo-Japan relations and stops in with Sapporo-based Simon Jackson, who seeks profits by marketing the peripherals. Can the Japanese surmount conflict and the Kuril controversy to cash in? New Zealander Simon Jackson might get rich by being the perfect Sakhalin middleman -- in Sapporo. After the rest of the world wrote them off, Japanese mobile companies are back in the driver's seat. Carping about crime, our sleek-finned sakana stares into mirrors, TVs and cinemas for a solution.